Sometimes after teaching lessons I wonder how much of what I teach in 45 minutes actually sticks with the students. In the field of education and working with young people, I guess it may be common to wonder every once in a while if students are really clicking with the messages. I put all worry aside after something that happened in Riceville one day. 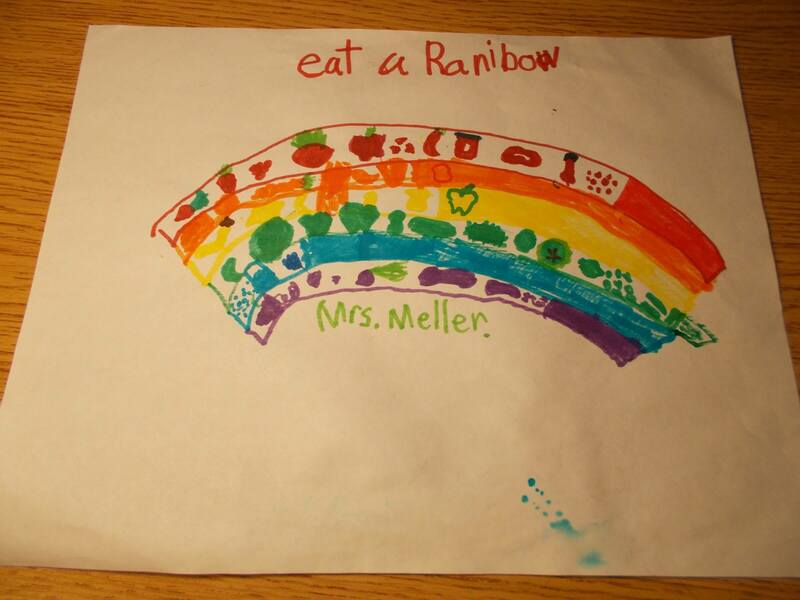 This past fall, I had been teaching lessons to the first grade about “Eating a Rainbow” and coloring their plates at lunch with different fruits and veggies. The lessons went well but as a new teacher, I didn’t know if what I was saying to them resonated. After my first lesson, I felt a little discouraged. The next week as I was leaving the same class after teaching a different lesson, one student ran over to me and handed me a drawing that she had made during her free time. She said she started eating a rainbow at lunch but the picture said it all. From that moment, I now know that kids really do retain the information we teach them and how influential and important this work that we do is. This entry was posted in Riceville CSD, School Wellness by admin. Bookmark the permalink.